Albuquerque is a vibrant college town, home to the University of New Mexico. It is also the largest city in New Mexico with 522,000. It was the 6th fastest growing city within the U.S in 2007. The city is set in a unique place near the mountains and harvests an interesting college culture. Old Town provides an engaging shopping and tourist destination. Albuquerque is trying hard to make the downtown an interesting destination. The city and surrounding area provide many outstanding recreation activities in the adjacent Sandia Mountains, including skiing. 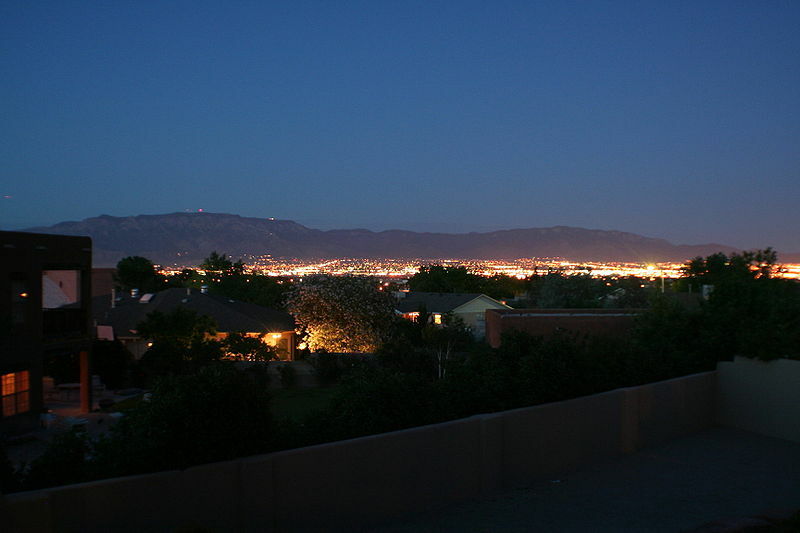 Photo of Albuquerque at dusk courtesy of Wikipedia and Asaavedra32. 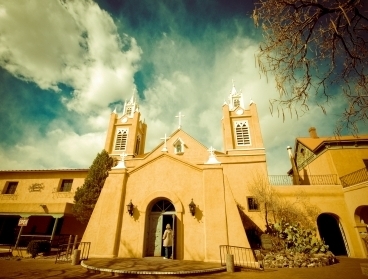 Albuquerque is popular with retirees because of its dry climate and beautiful scenery. As a result many active adult communities are available within the area. There are several neighborhoods within and around the town with beautiful homes and streets. Rio Rancho is a fast growing new community within the Albuquerque MSA that is the home to several master planned communities. Placitas is another area that at least one Topretirements visitors has chosen as her best place to retire. See link at top right for Albuquerque Active Communities. The median sale price of homes was $205,500 in the fourth quarter of 2018, according to the National Association of Realtors. The Sandia Mountains. University of New Mexico and its 18,000 students. Old Town. Outstanding mountain recreation and scenery. Great climate. Old history. Petroglyph National Monument. The Sandia Peak Tramway is the longest aerial passenger tramway in the world, ascending to the Sandia Mountains from the city. Very rich cultural infrastructure. Albuquerque is at an altitude of between just under 5,000 feet and almost 7,000 feet - one of the highest American cities. The Sandia Mountains are here and the Rio Grande River runs through it. Albuquerque is in central New Mexico. Winters tend to have daily high temperatures in the 40's and 50's, dropping into the 20's or 30's at night. Occasional snows usually melt by day's end. Albuquerque is home to 300 visual arts, music, dance, literary, film, ethnic, and craft organizations, museums, festivals and associations. These include National Hispanic Cultural Center of New Mexico as well as various companies for the ballet, theatre, and symphony. The University of New Mexico offers many cultural opportunities. Bubonicon is an annual science fiction conference. Other events include the gathering of nations pow-wow, the Albuquerque Balloon Fiesta, and the New Mexico State Fair. The crime rate in Albuqueque is well above the national average. Albuquerque is amply supplied with more than 10 hospitals including Lovelace Medical Center, Heart Hospital of New Mexico, and a VA Hospital. Transportation options include Amtrak, Greyhound, a new commuter rail system (New Mexico Rail Runner Express), 2 interstate highways, and 2 airports. The major airport, Albuquerque International Sunport, is only 3 miles from town. ABQ Ride provides bus transportation.